Mark C. bought this car from Drew B. in the Spring of 2011. According to the Cleveland Press newspaper article written in August of 1976, there were only 100 of these made for sales in Canada - which would make this car one of the most rare of all the S&H Torinos! 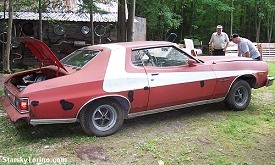 This car was built in April of 1976 and has a 351 Windsor, Magnum 500 wheels, and bucket seats (although it originally had a bench seat). This car has been featured here on this web site since November of 1999. 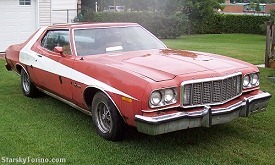 Previous owner, Drew, was at a car show earlier in 2007 in Ottawa (Canada) with his S&H Replica 1974 Gran Torino Sport, when Barry, who owned this car at the time, approached Drew. Drew says, "Barry said he loved my car and I almost fell over when he told me he had a Canadian S&H Torino. We talked for about an hour about parts that I need, and about his car. Over the rest of the Summer, I talked to Barry via e-mail about those parts that he had, and I kept dropping the hint about buying his car. Barry was extremely busy with family, but eventually he e-mailed me back asking if I wanted to see the car - my heart started to race. I saw it one Saturday and Barry and I came to a deal. 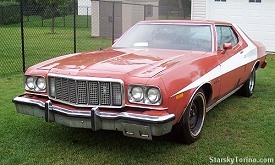 The car needs a complete body-off restoration, but based on the attention that my '74 Torino gets, I think it will be well worth it." 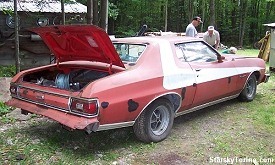 This car is very well documented as being a genuine S&H Torino. 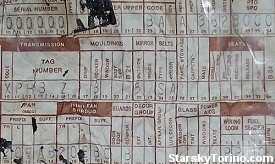 Mark has a build sheet, found under the seat, that has his car's serial number on it (the serial number is the last 6 numbers in the VIN, which I have disguised here as I usually do), and the car's Special Order number. In the "remarks" section it says, "Starsky and Hutch Unit PS122." 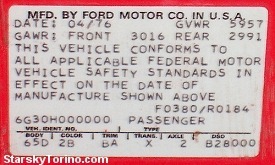 The Data sticker inside the driver's door opening also has the Special Order number on it, which in the case of the S&H Units built for sale in Canada is 8000, not 0022 like the cars built for sale in the USA. 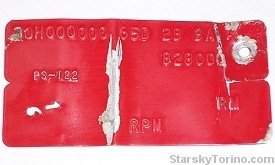 mark also has the metal tag from the firewall, which again contains the VIN, the DSO number, and also "PS-122." 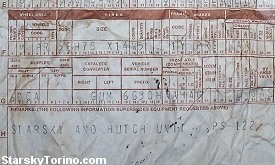 Not every S&H Torino I've seen has had "PS-122" stamped on the tag, but they all have the Special Order number on them - which is essentially the same. Created December 30, 2011. All Rights Reserved.